Forty years ago, singer and songwriter Jim Croce was enjoying new found success after signing a recording contract with ABC Records. 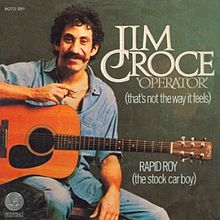 Croce released two albums and several singles, including You Don’t Mess Around with Jim, Operator (That’s Not the Way It Feels), and Time in a Bottle. His biggest single Bad, Bad Leroy Brown hit number one on the American charts in July 1973. Tragically, Croce died two months later, in September 1973, when the plane that was to take him from a performance in Louisiana to Texas on a concert tour crashed moments after take-off. Guitarist-songwriter Maury Muehleisen, who performed with Croce, and others, died in the crash. Croce left behind his wife Ingrid, a two-year-old son, and a number of hit songs that are still heard frequently today on radio stations across the country and available on CD and digital downloads. Through the years, some ham radio operators believed they contacted Croce in the 1970s when working WN3OQW of Drexel Hill, Pennsylvania, the town where Croce grew up. The name on the QSL card the operators treasured was indeed “Jim Croce” and the card bore the address 1114 Anderson Avenue, known to be the home of Croce’s parents. However, in corresponding with Croce’s widow Ingrid, she reveals that WN3OQW was Jim Croce’s father. “James senior was the ham radio operator in the family,” Ingrid said. “Jim was the DJ at Villanova. 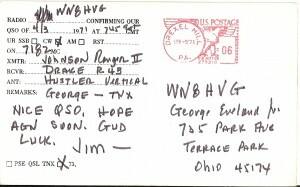 He had a three hour Sunday night gig on WWVU.” More than a few hams who contacted WN3OQW then received the QSL card in the mail believed they had con tacted the performer. But as Croce’s widow reveals, those hams instead had the privilege of working the man who gave us Croce and his timeless music. 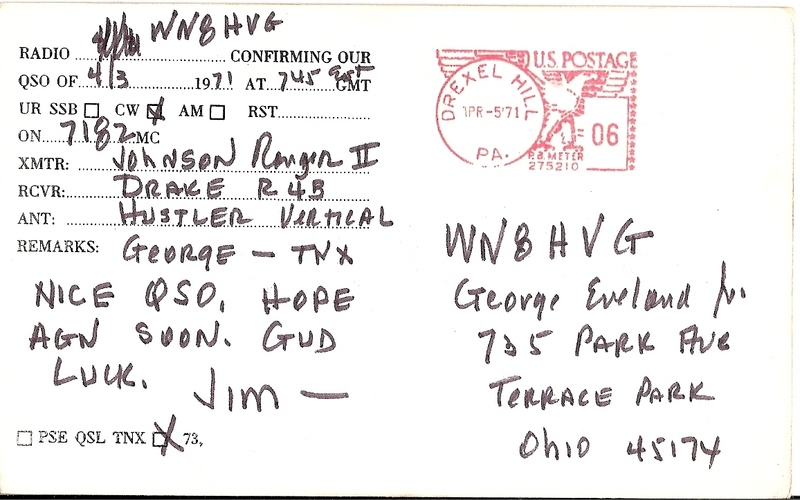 George Eveland W8VG, formerly of Stafford, Virginia, contacted Croce’s father in 1971 and, as can be seen in the images in this article, still has a WN3OQW QSL card and his logbook showing the contact. “I was running a Drake 2C I’d gotten for Christmas in 1969,” said George, who was 14 at the time and held call sign WN8HVG. “That day was a Saturday and the contact was early, about 7:45 a.m. so I probably slid right out of bed and went straight to my radio shack, which was in the back corner of my bedroom on second floor of house,” George said. 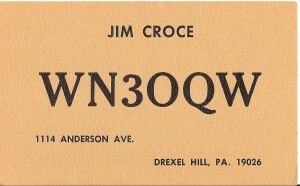 As can be seen on the reverse side of the senior Croce’s QSL card, Croce was running a Johnson Ranger II, Drake R4B receiver, and a Hustler vertical antenna. Eveland recalls listening to Jim Croce’s music during his teen years. “I remember sitting there during my senior year of high school listening to Operator, my favorite, and not being able to believe he was already gone,” he said. Special thanks to George Eveland W8VG for sharing his logbook and QSL card images. QSL card & logbook images copyright © George Eveland W8VG. All rights reserved. A search of the U.S. Copyright database produced no registrations for the image of Jim Croce, which appears to be in the public domain. Dave Jordan: No guidance abt blogging... just have fun, always take the high road and enjoy. © 2019 625 Sentinal. All rights reserved. Premium WordPress Themes.